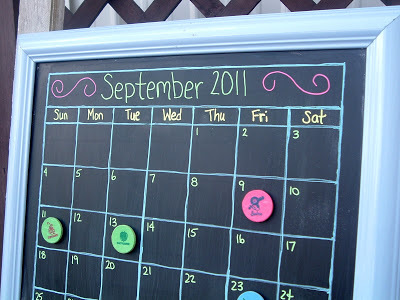 You are here: Home » mud room » Magnetic Chalkboard Calendar — Make your Own! 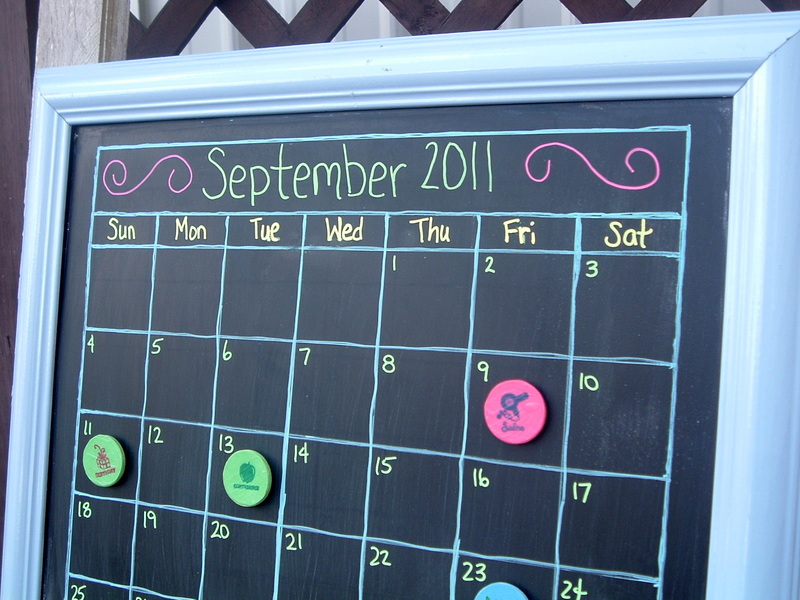 Magnetic Chalkboard Calendar — Make your Own! My magnetic chalkboard calendar! The perfect organization tool for the busy family. 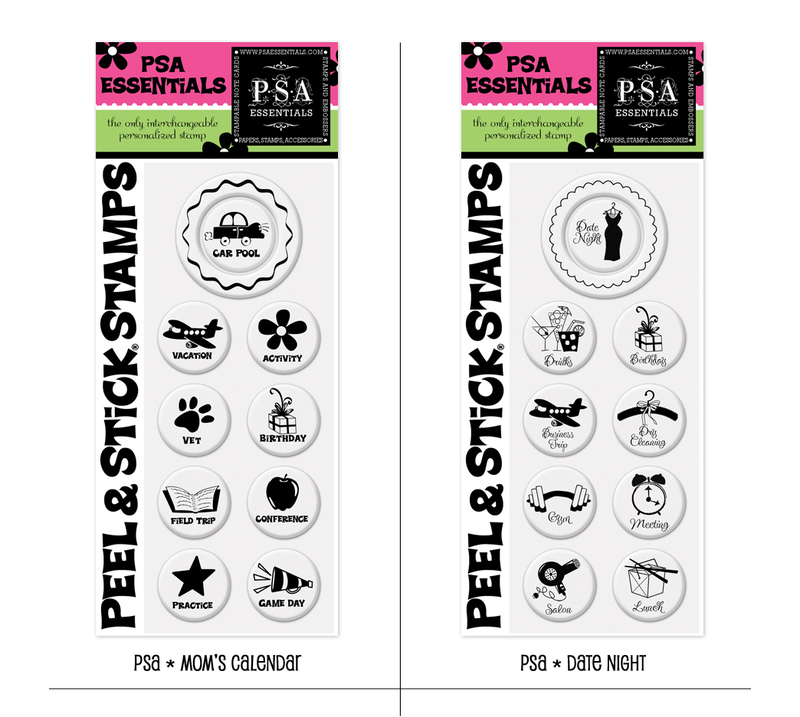 I made all sorts of magnets using the PSA stamps that I am sure you are going to love! 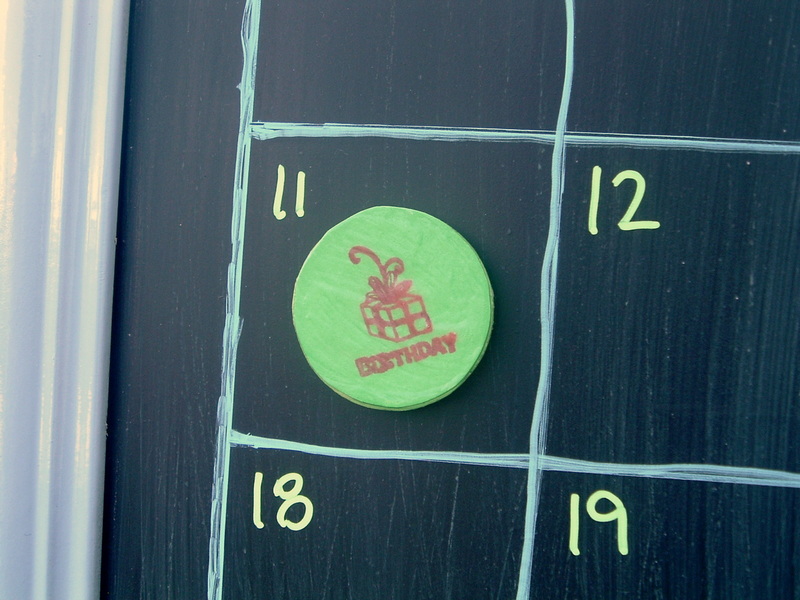 Let’s start with the calendar itself and move on to the magnets in a minute. 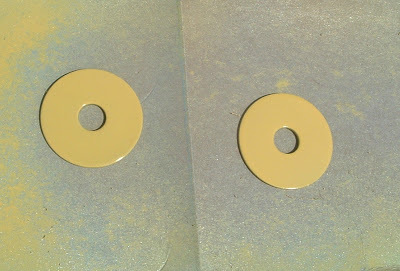 1) First take your metal piece and clean it really well. I used engine cleaner for cars. Anything that is made to clean metal. Rinse it really well and follow all package directions. 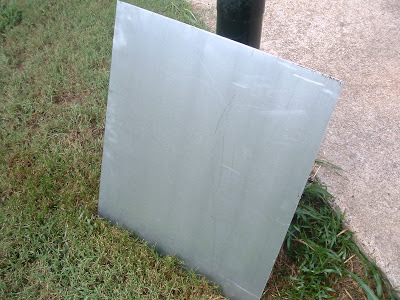 2) Next paint one side of your metal piece with one coat of primer plus two to three coats of chalkboard paint. Again follow all directions on your paint. Chalkboard paint generally has to cure for 24 hours before use so please be aware of that. 3) Now for the frame. I bought mine at a thrift store. I used a spray primer plus paint in one in Sky Blue. Paint whatever color you want. You can of course use a brush and regular paint instead if that is what you have. 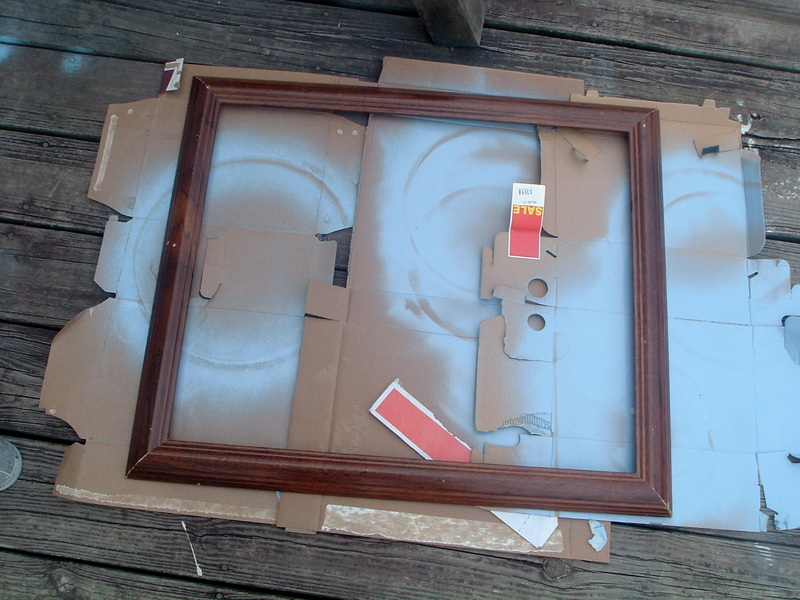 4) After the chalkboard paint has cured, be sure to follow the directions on the paint for conditioning it. Generally you rub chalk all over your surface and clean it back off. 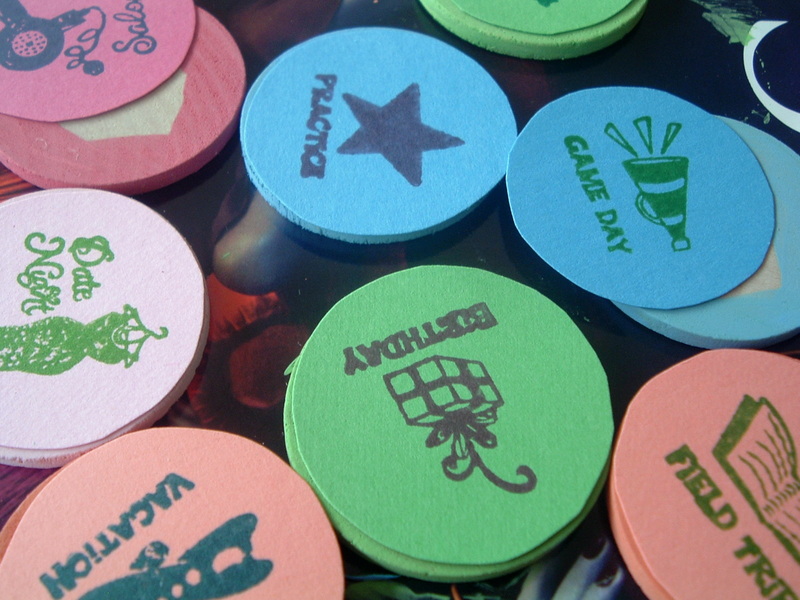 5) Do you know what chalk markers are? 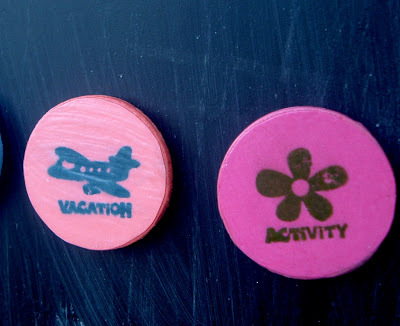 They are chalk but they are more permanent than regular chalk. You can find them at your local craft store. They come in white or fluorescent colors. I picked the colorful pack! Chalk markers only come off when they get wet. 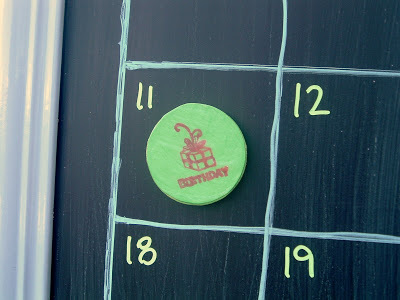 So no worries about smudging or accidentally wiping off your calendar. Plus the lines are so much more crisp! If you have ever wondered how those boards at your local restaurant look so great, the secret is chalk markers! Now that we have a magnetic chalkboard calendar, we need magnets to go along with it! 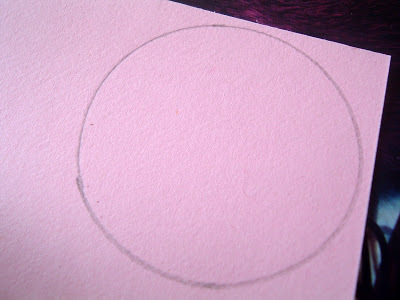 1) Paint the edges of your wood circles with craft paint (you could also just spray paint the entire circle). 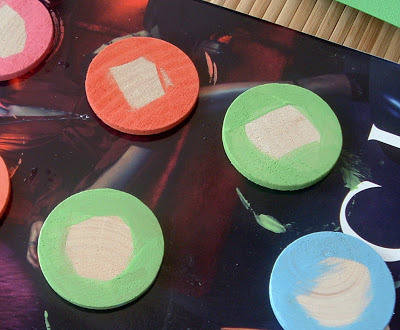 I used paint colors that matched the scrapbook paper I had on hand. 2) Trace your circles onto the craft paper and cut out. 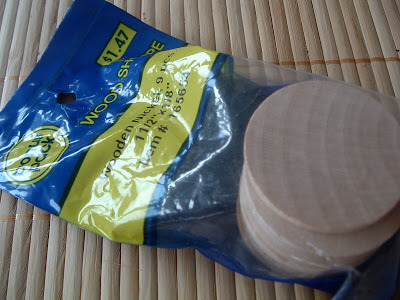 4) Layer on a few coats of mod podge. 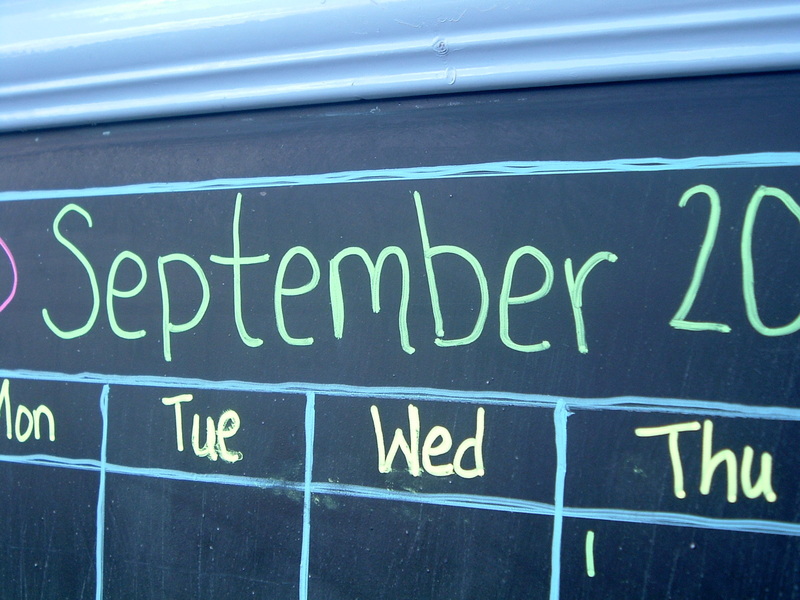 Oh how I wish that vacation magnet could have made it onto the September calendar! 🙂 But that is another subject! A completely optional accessory that I found were these magnetic clips. I used them to hold my chalk. 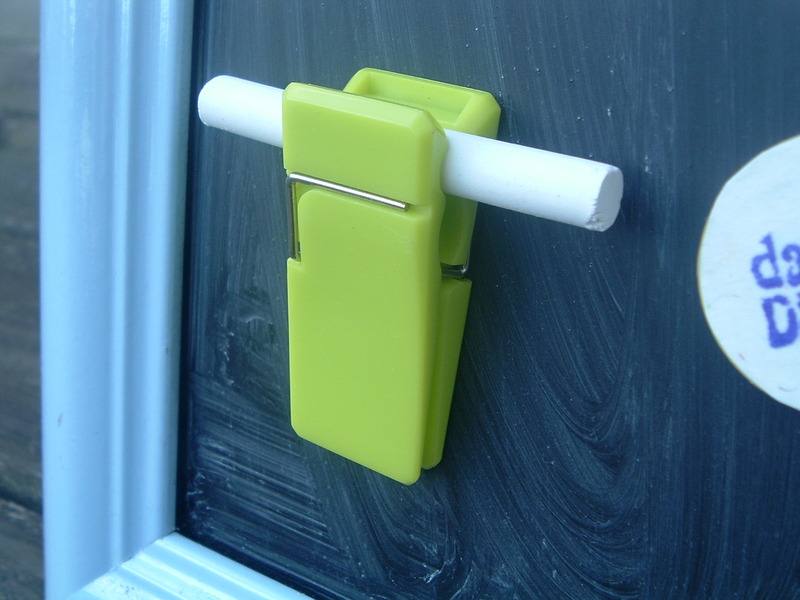 As you can see this is regular chalk. 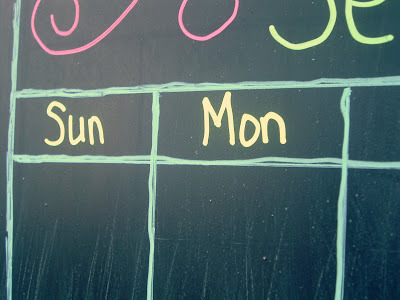 Writing on the calendar in regular chalk will allow me to erase any notes on the calendar without disturbing the chalk marker lines during the month! So I laid out our month of September…and yep we have a birthday this month! Daddy will be celebrating on the 11th! There you have it! 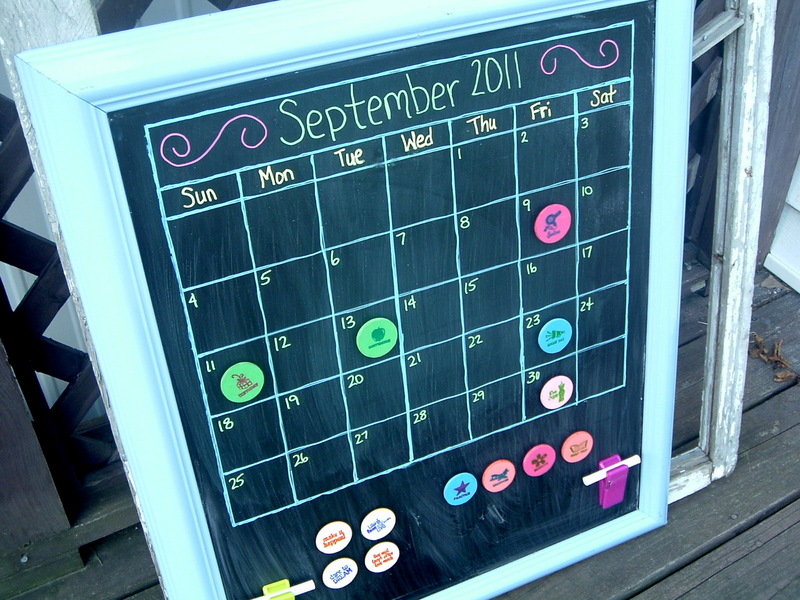 A magnetic chalkboard calendar to help keep you organized this school year! After all, who can actually remember all those due dates? trips? school functions? practices? games? — the list goes on and on!! There is plenty of room at the bottom of my calendar to store my extra magnets and my chalk clips. 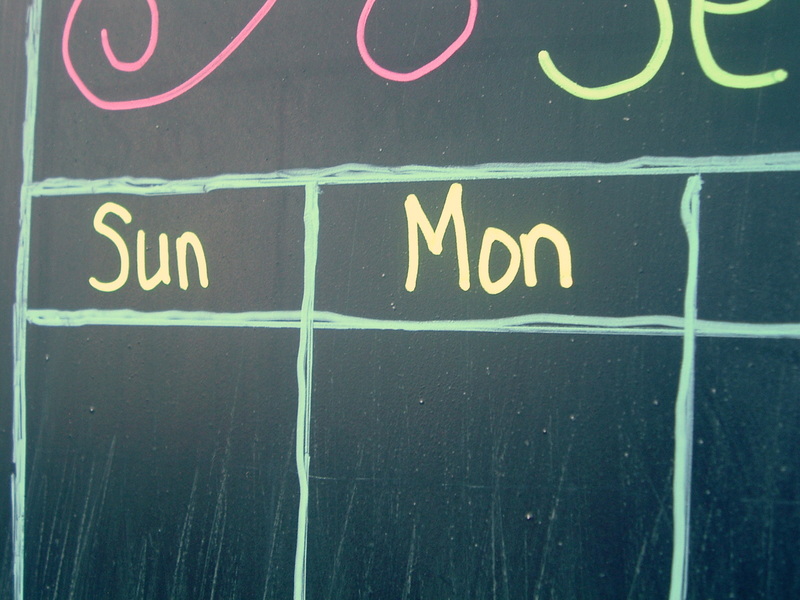 You might want to think about that when you are sizing your own calendar. I hope you make your own calendar and enjoy it as much as I enjoy mine! previous post: A Day in the Life — We have puppies!! next post: My Halloween Mantle — and a blog hop! I really love this! I’m going to make one and put inside my pantry door. Thank-you so much for the fabulous idea! Very cute! And oh so organizing. Thanks for sharing ;-). 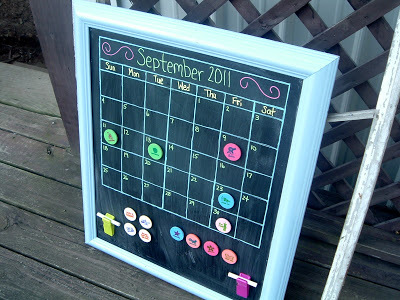 Looks a lot like my calendar (minus the screen) and magnets! 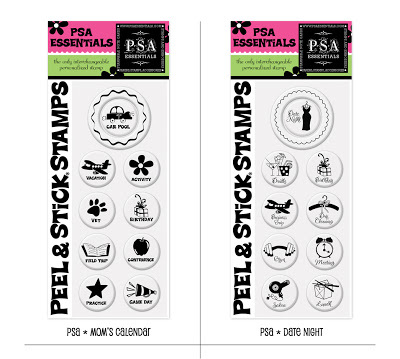 I like the stamps you used on yours … very cool! Being that the calendar hanging on my office wall reads “December 2010” makes it clear that I have a problem remembering to buy a new calendar! Perfect solution right here! 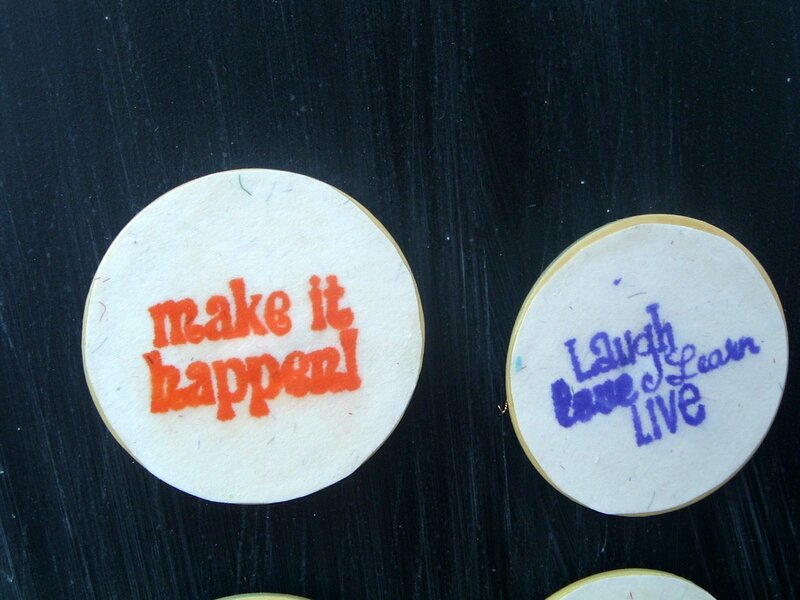 This is going on my to do list for sure! This looks great! Nice job. 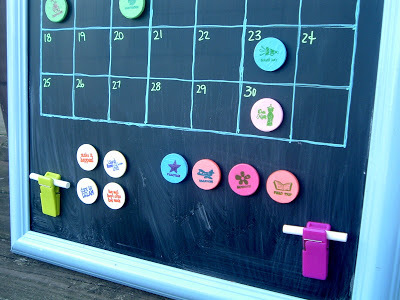 Such a great and cute way to get organized! Thanks for sharing. Oh my gosh! I love this! I found you through Serenity Now. Thanks so much for sharing! This is just so cute! Thanks so much for sharing this great tutorial! This is so cute and I will be featuring it on my blog tomorrow!